They should be known. The species name mezereum in Farsi means ”to kill”. The mezereon grows scattered in all Estonia, preferring fertile soils. 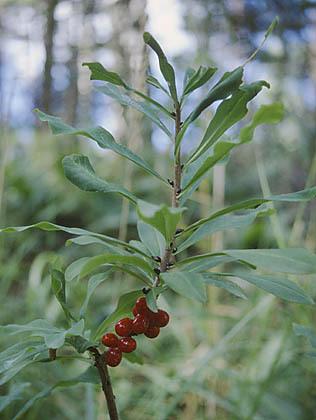 It is a sparsely branched shrub, growing up to one metre. The leaves are set differently, bundled towards the tips of the bush, fewer along the stalk. The beautiful, brightly-coloured drupes (”berries” in common speech) are set close to the branch and are very decorative in nature. The whole plant is toxic. Eating only a few berries already causes serious poisoning. It is estimated that eating a dozen berries would be lethal. 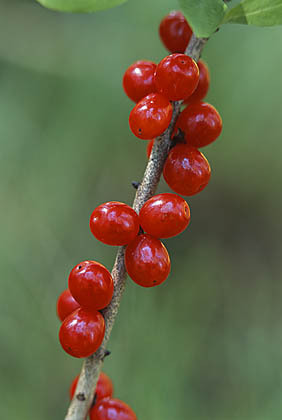 The berries are said to have a disgusting taste.